The following post is from Tami Perriman from the Vista/Carlsbad, California congregation of Community of Christ. I came across her article and liked it so requested her permission to re-post it here. Her story mirrors the experience of her congregation in following Christ into mission. I must be inspired by an impending visit from my 18 month old granddaughter. 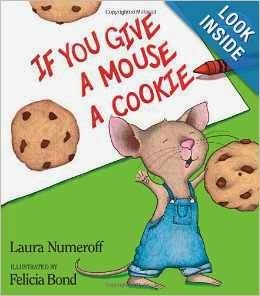 One of our favorite books is If You Give s Mouse a Cookie, by Laura Joffe Numeroff. I was thinking about the domino effect of mission in Community of Christ and feeling amazed, overwhelmed and blessed all at the same time. If you give a church a mission, then the church might sell everything it possesses so that it can follow Jesus Christ. And if it sells everything, then it will need to find a new place to worship. If it finds a new place to worship, then the church is going to encounter new friends. If the church finds new friends, some of those new friends are going to be hungry and the church will want to feed them. If the church provides food, more friends will come. With more friends, come more needs, so the church will start giving away clothing, blankets, sleeping bags and personal hygiene supplies. If the church starts giving away stuff, they will need more stuff to give away. If they need more stuff, God will provide by calling on the community and other churches to help. If the community and other churches help, more people can be served! It sounds similar to another prayer doesn’t it? "Oh that You would bless me indeed and enlarge my border, and that Your hand might be with me, and that You would keep me from harm that it may not pain me!" We are told that God blessed Jabez after he prayed this simple prayer. The Vista Community of Christ has seen God’s response to our prayer as well. In the children’s story, the author cautions against giving a mouse a cookie because of the never-ending cycle of events that happen. If you give a church a mission, prepare yourself for the same blossoming effects, and a never-ending cycle of blessings, for the church, the community, and for you personally as you respond to the call to be God’s hands, feet and heart in this kingdom. Doctrine and Covenants 162:7a. There are many lives waiting to hear the redeeming words of the gospel, or to be lifted from hopelessness by the hands of loving servants. But they will be lost to you without the generous response of disciples who share from their own bounty that others may know the joys of the kingdom. Give a church a mission, share from your bounty.